Other outdoor shops ~10% It’s always worth asking about a Scout/DofE discount in any outdoorsy shop as most of them offer around 10% off. Most shops accept a scarf as evidence. http://www.sportsdirect.com/ Always seems to have a 70% discount off everything, so well worth checking out. A good daysack is vital for many different activities. Check out our Information on Daysacks for some useful advice on choosing and packing yours. Line your rucksack with a rucksack liner or a strong plastic bag. Puts items that you are unlikely to require when walking during the day at the bottom of your rucksack. You will probably need your waterproof jacket and trousers during the expedition so keep them handy near the top of your rucksack. Keep first aid kit, torch, matches, money and other valuables inside a plastic bag and locate near the top of your rucksack or somewhere they can be easily found in an emergency. Keep your food and liquid for the day in a side pocket of your rucksack or near the top. Map, compass and route card will be used frequently and so must be easily accessible. Generally, heavy items such as tents should be packed close to your back and as high up as possible. This reduces the downward and backward pull on your back and should be more comfortable to carry. 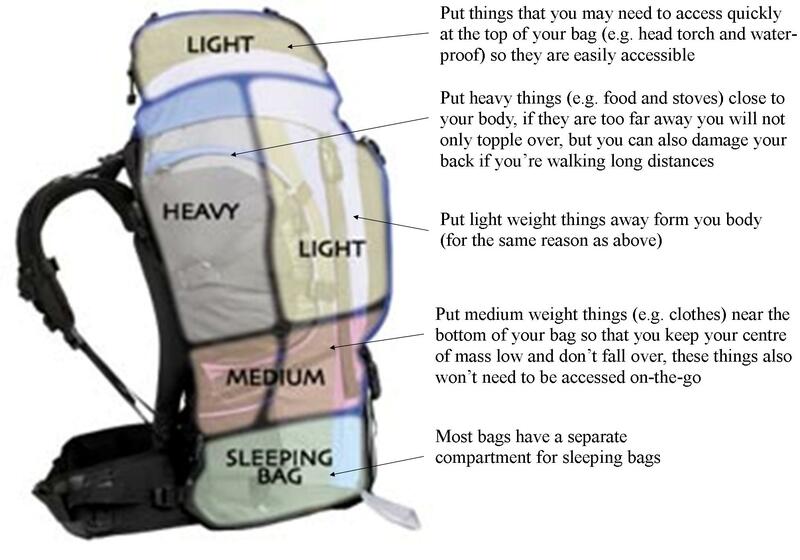 Avoid hanging items, particularly heavy ones, on the outside of your rucksack. The swinging motion will interfere with your walking rhythm and will make you tired more quickly. They will also get in the way and generally be annoying. You will be given a barrel (see the picture on the left), which you will need to fit all of your personal kit into (you will be given other barrels for food and group kit). The barrels are waterproof, but they have been known to leak in the past (especially if they are not done up correctly) so it is recommended to put you kit in dry bags inside the barrel. Some people like to use one big one and some people like to use several smaller ones to organise their things. A small dry bag is also useful to keep with you inside the boat and put in things like a torch and first-aid kit so it is easy to get to without having open up a barrel. The good news: unlike walking you don’t have too worry much about the weight of your kit, or where it goes in the barrel, as you only need to carry it short distances.